FSU football not just finished with one of the best classes in the entire country, but again came out on top of the rankings among ACC teams. For the last eight recruiting classes, one thing has been for sure – FSU football was going to be one of the top teams when it came to the final rankings after National Signing Day. 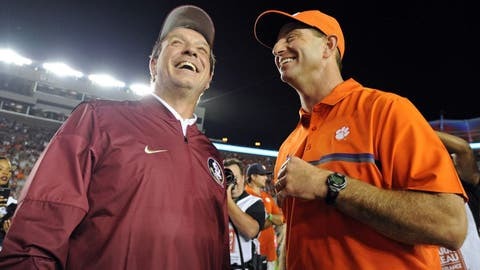 Another thing you could count on was that the Seminoles would be on top of the teams making up the ACC. In 2017, there was no difference as the ‘Noles again had the top ranked team of the 14 member conference – and quite frankly, it wasn’t even close. According to Rivals 247 rankings late Wednesday afternoon following the announcement of Marvin Wilson coming to Tallahassee, FSU football finished with the fifth ranked class in the entire country – just two points behind a Michigan team they beat in the Orange Bowl this past December. Three other teams found themselves ranked in the top 100 – Virginia (No. 51), Syracuse (No. 58) and Wake Forest (No. 67). That leaves Boston College as the only ACC team who didn’t have a recruiting class in single or double digits in the conference. The numbers are even more impressive when you look at the fact that FSU football had more five star recruits (four) than the other 13 teams in the conference had combined. In fact, Clemson was the only other team to have one with five stars (three players in all) – which means the two teams that have been the best in the ACC will again be reloaded for the 2017 season.